Why vote for the "lesser of two evils" this year when you can vote for the Greater Evil? Dread Cthulhu, dead but dreaming in the sunken city of R'lyeh, is the true candidate for change. Come usher in the Old Ancient One to the 21st century. 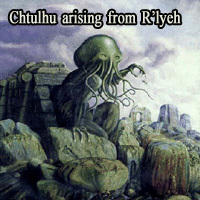 Out of the users that have visited this site 18 out of 65123 say they would write in Chthulhu if they knew the write in would help get him elected for president. (Not every candidate is registered/eligible for write in votes in every state).